Work continues apace on the J27. The cab has now been fully secured, the beading added and the heads ground, ready for John Furness to hopefully paint it next week. The ejector pipe work is in and finished, and the reservoir release trigger was due to be delivered from Paul Hutchinson's workshop to Grosmont today. The gradable steam brake operating valve (which includes the pilot valve) has been fitted, all the gauges calibrated, and the driver's side front spectatcle plate also fitted. The cladding is proving a challenge to fit however, particularly over the manifold, and will require some adjustments and remedial work to make a neat job. At the smokebox, following advice from Richard Pearson, the front plate has been measured and found to be needing lifting by half an inch. 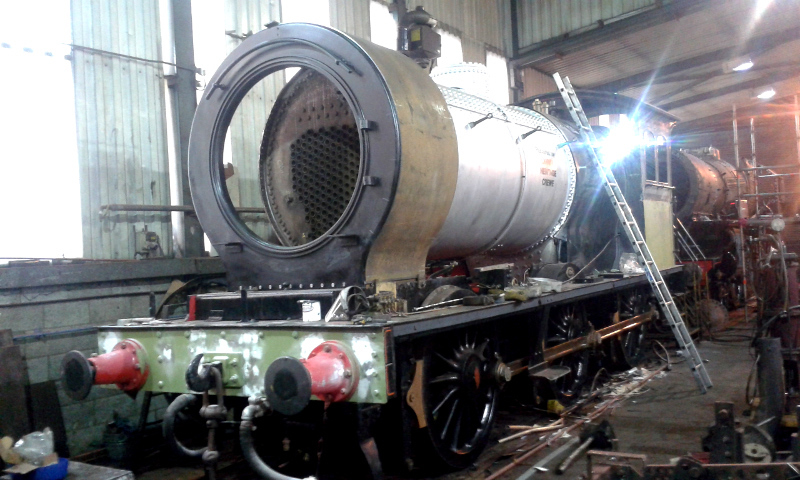 That has been done, and Phil Naylor is now on with fitting the LHS half of the new wrapper (see photo). This is currently being tacked in position to allow accurate positioning before drilling the holes to fix it to the smokebox. It will be bolted on with rivet headed bolts, rather than being rivetted, as that will make it easier to remove if access is needed to the bottom tubes for any reason. The JVs also stripped the red oxide primer off the front plate at the weekend, and it is now in black undercoat. Sean Bowler should be starting to do the checks of the motion - pistons, rods, valves etc - next week. The tender has not yet been weighed because of the problems with the B1 weighing, but hopefully they will soon be resolved and the tender weighed next week. In the meantime, Nigel has prepped the tender rear buffer beam, ready for John Furness to paint it along with the front buffer beam on the locomotive.